Multicolor angelfish larvae (Centropyge multicolor) were raised from captive-spawned eggs at 77-79F on wild copepods and artemia. First record of Multicolor angelfish culture. 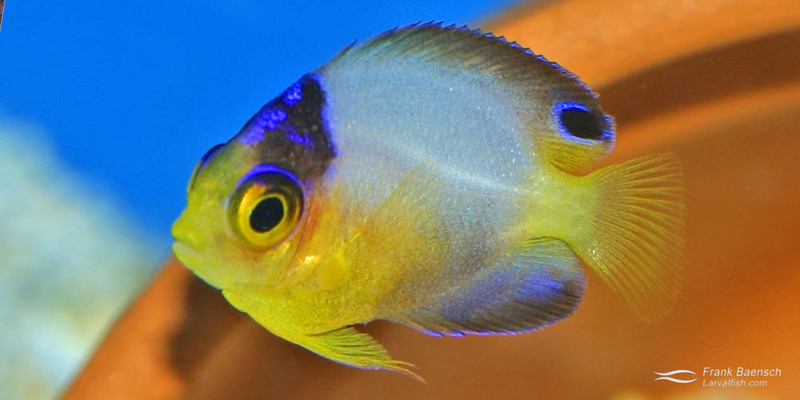 The Multicolor angelfish was rare in the trade but is now more commonly available. This species has a relatively wide distribution, occurring from Palau to Tahiti and the Marshall Islands. It lives in deeper, 20 to 60 meter coral reefs. This species is exceptionally hardy and well suited for captivity. It thrives on gel diet, flakes and adult brine shrimp and prefers water temperatures from 76 to 81º F.
Left: A pair of Multicolor Angelfish (male on right). Right: A 105-day-old Multicolor Angelfish juvenile. Multicolor Angelfish larvae can take up to 55 days to complete metamorphosis when provided with improper settlement conditions.